Exclusive! Detect and Manage Setups on Virtual MachinesNow InstallAware can check your target system and detect whether the operating system is running on a virtual machine. A simple checkbox lets you limit distributions to physical machines.The Only Installer with Aero Glass SupportNow with Aero Glass support, InstallAware\'s powerful dialog editor lets you customize the 17 pre-built setup themes, or design your own. A full range of visual controls are available, including Explorer-style browsers, HTML/Flash containers, and now custom glass surfaces.Exclusive! Extend Setups with Plug-InsBuild your own setup plug-ins that natively interact with InstallAware MSIcode. 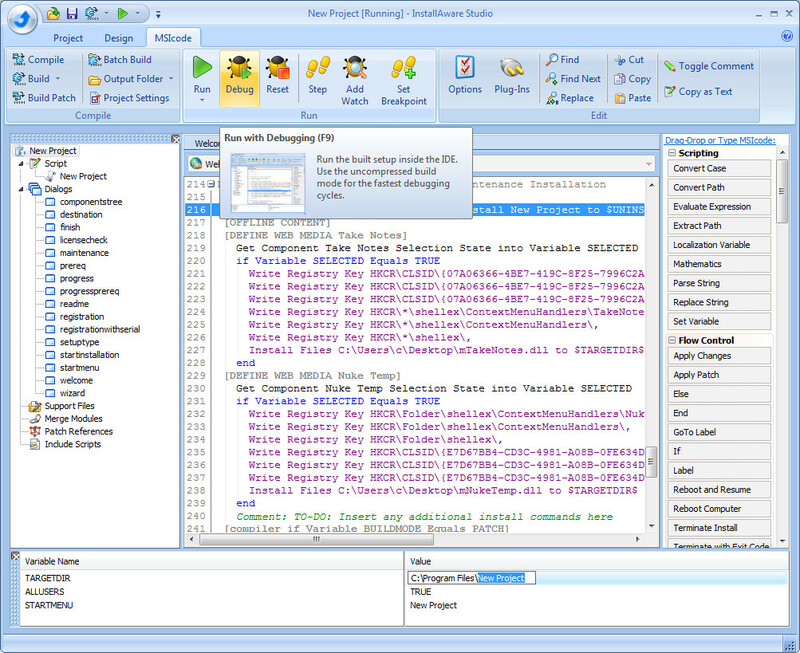 Use your favorite programming language to perform complex setup tasks, without being encumbered by MSI constraints or a foreign development environment.Integrated DebuggingDebug your setups visually with the integrated debugger. Set variable watches, step through code line by line, override variable values.Enhanced! Simplified Translation ToolsUse InstallAware\'s visual localization tool to translate your user interface and MSIcode text, or send the freely-redistributable localization tool to an off-site service so they can perform the localization for you. Switch languages at compile time or runtime. Existing translations are preserved when making changes to your MSIcode and user interface.Exclusive! Collect User Feedback and Product RegistrationsAn easily edited sample project demonstrates how to perform online user registration as part of the installation process. When uninstalling, the project asks the user for product feedback and submits it to your website.New! Serial Number GenerationA new sample project provides MSIcode to build a unique 25 digit serial number generator and perform serial number validation in your wizard based on variables such as username, company, and/or other criteria. Serial numbers are not restricted to a simple range of numbers. Windows 32-bit software developers can use SoftwareKey Trial Creator, a freeware program, to create fully- functional 30-day trial versions of their software program without modifying a line of source code.